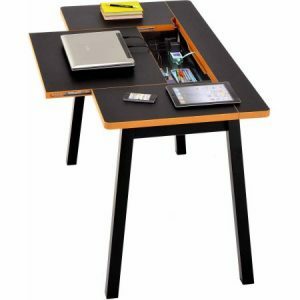 This office desk with storage features an innovative design that maximizes storage and function while maintaining a minimal footprint. A 1" heavy-duty main panel provides a surface for work, gaming and study. The PVC laminate material is sleek and ready to face your everyday tasks. It slides open to reveal a hidden place to store pens, pencils or whatever supplies that the user likes to keep close at hand.